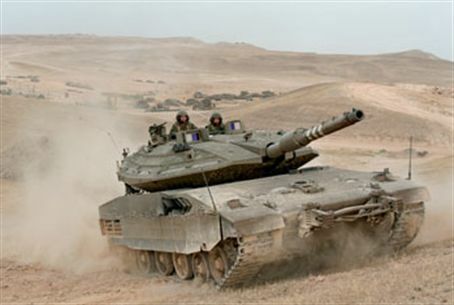 The “Trophy” tank protection system aced a test Wednesday, taking out an anti-tank rocket during a Golan exercise. The Trophy tank protection system was successfully tested this week, when it shot down an anti-tank missile during an exercise in the Golan. The IDF will be deploying tanks that have the protection system along the Gaza border. The system was developed by Israeli weaponry manufacturer RAFAEL. It is an active protection system, which does not boost the tank's armor, but rather destroys incoming missiles and rockets. Details of how the system destroys incoming weapons have been kept deliberately vague. A second version, dubbed Trophy Light, is designed for use on light and medium armored vehicles. The system, known in Israel as Windbreaker (Me'il Ruach), will soon be put into use in the Gaza region. The IDF plans to install the system in several tanks. Gaza terrorists have used more advanced weapons in past months than they did previously, and two weeks ago, it was revealed today by the IDF, fired a long-range Russian-made Komet missile at an IDF tank for the first time, piercing its hull but causing no injuries.